When you need to find the proper cleaning equipment to meet your commercial cleaning needs, come to us at Hillyard in Lancaster, PA. We provide customers throughout central Pennsylvania and surrounding areas with the following machines: Scrubbers, Sweepers, Buffers, Extractors, Wet Vacuums, Pressure Washers, and more! If you run any type of business in Lancaster or any of the nearby communities, you likely have an ongoing need to keep it clean, either for appearance sake or in order to comply with state, federal, or industry regulations. In order to do this, you’ll need to have dependable and top-quality cleaning equipment that’s also affordable and easily accessible. Take comfort in knowing that Hillyard Lancaster has all of the professional cleaning equipment you’ll need to present an orderly, safe, sanitary, and welcoming environment. We specialize in commercial and industrial floor cleaning equipment. Since such equipment can be a significant investment, especially for smaller businesses in the Lancaster area, we offer a wide selection of cost-effective, top-notch used commercial cleaning machines. Whether you have a floor cleaning machine that’s acting funny or commercial carpet cleaning equipment that suddenly stops working, our trained technicians are prepared to help. We offer flexible service solutions provided by a reliable and responsive staff. Sometimes well-maintained and reliable industrial carpet cleaning machines, scrubbers, and commercial vacuums simply need a new part or two to perform like new. Instead of stressing yourself out trying to find the right part for your floor cleaning machine, call on us for your replacement part needs. We carry replacement parts for many common and popular brands. Our focus isn’t just on equipment sales and rentals. We’re equally committed to making sure our commercial clients safely use any equipment we offer or service. This is why we offer informative seminars on how to safely use and correctly maintain commercial and industrial cleaning equipment. See for yourself why Hillyard Lancaster Cleaning Equipment is the only name you need to know when looking for affordable and reliable professional cleaning equipment to rent or purchase used. Contact us today to learn more about our services and available equipment. Our high-performance cleaning equipment offers the durability and cleaning power your commercial or industrial business needs. Auto Scrubbers come in all different models. There are walk behind, stand-on, ride-on, electric and battery floor scrubbers. These machines can handle various sized jobs. However, their purpose is to clean hard floor areas that would typically be found in hotels, schools, hospitals, stores, warehouses and laboratories. When you need to clean closely-packed spaces with a small sweeper or large floor spots with an industrial floor sweeper, visit us. Our floor sweepers feature battery operated or manual push designs which are extremely convenient for the user. Carpet extractors are used to get rid of those pesky stains, dirt, allergens, grit and sand that get buried deep into carpets. With one of these machines, carpets will come away looking brand new. Our extractors work efficiently on any carpet or rug and uses an indirect spray so that carpets dry faster. These machines also offer an upholstery cleaning tool so that furniture and carpets can be cleaned simultaneously. While a wet vacuum can be used for dry spills on the floor, as the name suggests, wet vacs are mainly employed for those wet messes. Our commercial wet/dry vacuum has roto-molded tanks that are extremely easy to empty due to the rear-mounted drain hose. They also come with an adjustable handle to accommodate any height that also folds downs to make transporting these wet vacuums a breeze. All our industrial cleaning equipment is designed to help you get the job done faster and easier, who wouldn’t love that! Commercial cleaning equipment like pressure washers are used to clean parking lots and driveways, building exteriors like brick, stucco or siding, outdoor power equipment and so much more. They are known to get rid of some of the toughest stains and dirt, while completely cutting down your cleaning time. 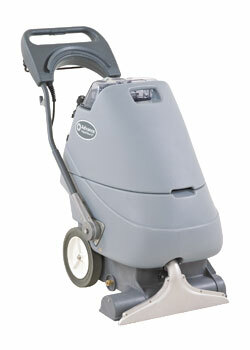 Hillyard Lancaster offers a full line of pressure washers.